STANFORD, Calif. – Four Stanford student-athletes – Elise Cranny, Lindsey Engel, Ted Miclau, and Robert Neff – were awarded NCAA Postgraduate Scholarships for their academic and athletic achievements. NCAA Postgraduate Scholarship winners receive a one-time grant of $7,500. To qualify, they must be in their final year of eligibility and plan to pursue graduate studies within the next three years. In addition to maintaining at least a 3.2 grade-point average, they must perform with distinction in their sport and be nominated by their institution’s faculty athletics representative. Cranny is a 10-time All-American in cross country and track and field. Cranny shattered the Stanford indoor and Mountain Pacific Sports Federation championships meet record in the mile, capturing the conference title in 4:31.29. 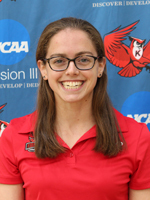 She went on the place fifth in the event at the NCAA Indoor Championships and was part of the Cardinal distance medley relay team that placed a narrow second in a school record, that was the fifth-fastest in collegiate history, and the fastest runner-up time in NCAA history. This spring, she won the Pac-12 5,000-meter title and competes in the NCAA West Prelims this week. Cranny is a human biology major who plans to attend medical school, with a focus on either psychiatry or pediatric oncology. Engel is a 10-time All-American in swimming and a member of two NCAA and Pac-12 championship teams. A butterfly specialist, Engel is No. 7 on Stanford’s all-time list at 100 meters, ninth in the 200. She also is No. 9 in the 100 backstroke and won a 2015 NCAA title in the 400 freestyle relay. She is a three-time CSCAA All-Academic first-team selection and three-time Pac-12 All-Academic first-team choice. Engel is majoring in mechanical engineering, which she will continue to study in a co-term program, with a concentration in energy systems. She will analyze energy conversion and storage. Her aspirations include working for an aerospace company like NASA or SpaceX as a test engineer. Miclau is a two-time All-American in diving, with a specialty on the platform, capturing the Pac-12 title in that event this year after a pair of runner-up finishes. Miclau is a two-time CSCAA Academic All-American and a three-time Pac-12 All-Academic first-team selection. Miclau is a human biology major with a concentration on neurobiology and society. He will seek a master’s in Stanford Medicine’s Community Health and Prevention Research program, with a goal of assisting vulnerable and under-represented populations with a goal of reducing morbidity and mortality through novel approaches to health-care policies and preventive medicine. Neff is a six-time All-American in gymnastics and closed out his career with his second consecutive NCAA high bar championship. Neff, who earned a spot on the U.S. national team in 2017, helped Stanford to four NCAA top-four team finishes, including two second-places. Neff is a four-time CGA All-America Scholar-Athlete and three-time MPSF Scholar-Athlete selection. Neff is completing his master’s co-term in computer and network security and will continue at Stanford as a full-time graduate student, using the postgraduate award to help mitigate costs as he continues to train. Neff is interested in startups and companies that combine research and development of graphics technologies with narrative literature and interactive stories to engage large audiences throughout the globe. Stanford’s overall total of NCAA postgraduate scholarship recipients is now 166. The above press release was posted by Swimming World in conjunction with Stanford University Athletics. For press releases and advertising inquiries please contact Advertising@SwimmingWorld.com. Lives in PH. II. Local girl.